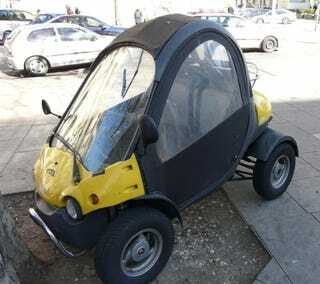 We have no idea what this is, but after the Peel Trident, this is probably the smallest street legal vehicle we've ever seen. And despite our best deciphering and sleuthing efforts, it remains unidentified. F-gobble-de-gook Tech was the best we could get out of it. How can someone get into this thing and feel fine about it? We'd rather take our chances on a regular scoot, at least there you can jump away from a wreck. But hey, this is a convertible and has those fancy, new fangled canvas doors. We're not modern European traffic law standards scholars, but we're assuming there is a 50 cc quadracycle kind of niche carved out below regular cars as kei cars work in Japan. This particular one has a 50 cc license plate which we assume means a 49 cc scooter motor and you can see the CVT poking out the bottom. I suppose if you don't want to put up with the wind and maybe have an inner ear infection causing vertigo and mild insanity, this makes sense.